What was in the Ark of the Covenant and what Happened to it? 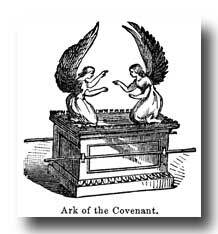 Throughout most of the Old Testament the Ark of the Covenant is the most important material thing. Whenever it was taken it was written about and the ark was regained. Yet nothing at all is written in the Bible explaining why or where it had gone. In fact there isnt even any mention of it all! Not even a simple “Hey the ark went missing!” It is just gone without a word. That doesnt seem right to me. I feel like ‘they’ would have certainly written about it. Maybe something WAS written about it and it didnt make it into the official publication. Perhaps it was even destroyed. What was in the Ark? Judging by a lot of the descriptions I read in the Bible there appears to have been something radioactive in the ark. Perhaps it was the tablets themselves that were radioactive? Remember how Moses’ face was so disfigured by the event on Mt Sinai? From that day on he couldnt go in front of people without covering his face because it was so bad to look at. (Hmm they never have that part in any of the movies or story books). Why Such Differences in the Way God is Presented in the Old Testament and the New? In another question, What is Salvation all About and is it Necessary?, the discussion turned toward the question about the differences in the way God is presented in the Old and New testaments. In the Old testament God is presented as being jealous and vengeful. God ordered the slaughter of thousands and thousands of people. So why do you think there is such a dramatic difference between the way God is described in the two parts of the Bible? Is There A Right One? In light of all the different beliefs and teachings I’ve been reading on this site, a question crossed my mind. How do we know that there isn�t one correct religion? There isn’t one way to worship God? Most do believe there is a higher power. Don’t you think God wants his worship a certain way? He basically said that through these scriptures that there is one way God wants his worship to be. Those that practice from there our inclinations, who profess to worship God, will be rejected. What do you�ll think? What is Salvation all About and is it Necessary? Christians say that the way to heaven is through Jesus and they say that you have to accept Jesus as your personal savior. I believe in Jesus but It’s always seemed wrong to me somehow that I could go straight to heaven and make Jesus suffer for what I’ve done wrong. I feel like, if someone has to suffer for the ‘sins’ I’ve done then it should be me. I feel like I could never be happy or ‘in heaven’ if I didn’t feel I deserved to be there. This question has played on my mind for a while especially thinking I may have to suffer when I die. I would really like to hear people opinions, Thank you. What is the Doctrine of the Trinity About? Do you believe that there are 3 seperate deities? Or are they all one and the same? Are Jesus and God and the Holy Spirit the same “entity” or are they different? How did the idea of “3 in 1″ come about and how did it become a part of Christianity? In the first chapter, verse 21 speaks of God creating man and woman… no mention of the woman being made from Adam’s rib. It isn’t until the second chapter, verse 22 that woman was created from man. I looked at the King James version of the Bible and verse 21 chapter 1 says and god created great whales and every living creature that moveth but no mention of crating man and woman? I also check the Vulgate Bible and same. What Bible can I find this reference. As for the Isaiah 34:14 it’s there. Am I Talking to God? OK, so I start probably with the statement that I am Christian but kind of my own way (I don’t go to church, I don�t feel very good there, and I don’t listen to and don’t believe church) just for clear. How could I get to know, please? Every time I ask our God to help me find out this, he says: “Listen to your heart.” But sometimes it’s just very confusing. So my question is: How can I be sure that I’m really talking to our Lord and plus how can I have closer relationship with Him? Why Such Hatred for Me and My Religion – Possessed? One year my family moved to the city, I of course had to change schools and went to a new bigger middle school. I met a girl there a few days after I started, I was so excited to have a friend in the new school. After a few days she got really cold and eventually the friendship fell apart. I don’t know exactly at what point I revealed I was Christian, but after the friendship split she hated me with a passion. This was not your everyday hatred, she always had a hatred for my religion, even if I wasn’t paying attention to her she would come up to me insulting my belief in God. I pissed her off even more when I didn’t pay attention and continued believing and loving God. One of her friends even approached me and said that she may act like she hates me, but she does not hate me as much as her friend does. I believe that she was wiccan or practiced some type of black magic. She still hates me up to this day about 7 years later. I found her on Facebook just to see how she would react, of course she reacted negatively and I haven’t contacted her since. After thinking on it I knew that this was no regular hatred and now I have the feeling that she may have been possessed and just the thought of me believing in God disgusted her. Coincidentally she has the same birthday as me (which makes it even more strange).